We love discovering talented young locals doing inspiring creative work. Albertine Lello, the one-woman band behind jewellery brand Pigment Studio is our latest discovery. We love her innovative, simple and incredibly versatile pieces. Recently I got in touch with Albertine to find out more about Pigment Studio and where her inspiration comes from. How did you come up with the idea for Pigment Studio? -The idea to create Pigment Studio was kind of the result of messing around with making a few items of jewellery. Initially I was just selling my pieces through Instagram, but eventually I was getting quite a few orders so I decided to make an actual online store to facilitate the selling process. Pigment Studio is also the name of my blog, which is an amalgamation of some of my interests including skincare, beauty, fashion, etc. Who is the Pigment Studio woman? -I like to think that she is someone who appreciates unique and handcrafted pieces, someone who is forward thinking and isn't afraid to go against the grain. What is your favourite thing about creating unique jewellery? -I love being able to create pieces of art that people can wear! It's a form of art that you can touch and interact with, which is really awesome! Who would your dream collaboration be with? What would you create? -Hmm...that's a really difficult one because I have so many people/brands I'd love to collaborate with! One of the people I can think of at the moment is Solange Knowles. I love her music and her general vibe and aesthetic, so I think she'd be a really awesome lady to work with. If I had the chance to create a line with her, I'd be so down to design a bunch of cool dangly earrings and maybe some contemporary bangles. Which of your pieces is your favourite to wear and why? -I really love the Tabitha's, not only because the design is really simple and contemporary, but also because they are named after my lovely cousin who I absolutely adore. 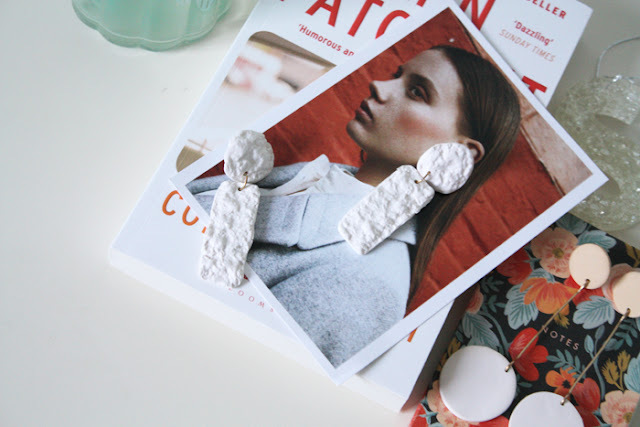 The Tabitha earrings have a textured surface to them, which is created by an oyster shell I picked up one day, when Tabitha and I were at the beach. They will always be a special piece in the collection to me. We love that you use materials like clay and wire in your pieces. Which is your favourite material to work with? -I love working with both wire and clay because they are complete opposites in terms of materiality. Wire is linear, hard and requires tools to manipulate, whereas clay is squishy and mould-able. Clay also means that I can experiment with more colorus and textures which is always fun! What is in the pipeline for Pigment Studio? Can you give us any sneak peeks? -I have a couple of things in the works, which is very exciting! I am working on some new designs as well as some new collections...*cough necklaces and hair accessories cough*. I don't want to give too much away yet but all will be revealed soon! Finally, if you could have one iconic women wear your pieces, who would it be and why? -Well as I mentioned before, Solange is an obvious choice, but two other women who I would love to see wearing my pieces are Grace Coddington and Lea Seydoux. I think these ladies are so gorgeous and talented at what they do. Is it obvious I have a hard time choosing just one person!? *You can shop Albertine's pieces online here and also in Auckland at The Bread and Butter Letter and Auckland Art Gallery.